Three years after helping the Red Sox win their first World Series in 85 years, David Ortiz was at it again. 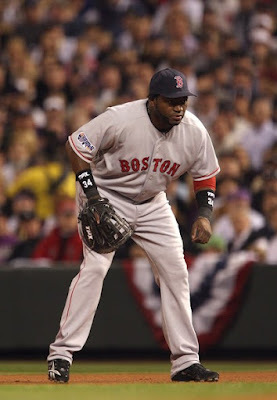 After a great 2007 season hitting .332/.445/.621 with 35 homers and 117 RBIs, Ortiz led the Sox to another playoff berth. Once the 2007 playoffs started, Ortiz never looked backed. He continued to stay hot at the plate all the way throughout the playoffs. He recorded a hit in his first nine games and led the Red Sox to a World Series date with the Colorado Rockies. The Red Sox swept the Rockies in the World Series with Ortiz batting .333 with three doubles and four RBIs. Ortiz even played games 3 and 4 at first base in Colorado. The 2007 postseason was another example of how clutch Ortiz was. While he didn't have that 'signature' hit like 2004 or 2007, he batted .370 with six doubles, three home runs, ten RBIs and had a .508 on-base percentage. Much like all the Red Sox recent title runs, they probably wouldn't have happened with Ortiz. Which #PapiMoment do you want to hear about? Let me know below or find me on Twitter?